Democratic candidate for president U.S. Sen. Bernie Sanders meets the Quad-City Times editorial board Friday in Davenport. Democratic candidate for president U.S. Sen. Bernie Sanders meets with the Quad-City Times editorial board Friday in Davenport. Democratic candidate for president U.S. Sen. Bernie Sanders, right, meets with the Quad-City Times editorial board Friday in Davenport. Democratic candidate for president U.S. Sen. Bernie Sanders meets with the Quad-City Times editorial board in May in Davenport. Reporter Ed Tibbetts has a question for Democratic candidate for president U.S. Sen. Bernie Sanders during a Quad-City Times editorial board meeting Friday in Davenport. President Bernie Sanders would spend little time placating congressional opponents. The 73-year-old senator from Vermont told the Times Editorial Board he would replicate his playbook from his years as mayor of Burlington, Vermont: Build an independent coalition around reform ideas, then let voters apply pressure. At age 44, Sanders won his first mayoral post by 10 votes, then faced a hostile council expecting a single term. Instead, he focused on ideas, not personalities, and built popular support for big change. The next election brought enough sympathetic aldermen to support his veto. 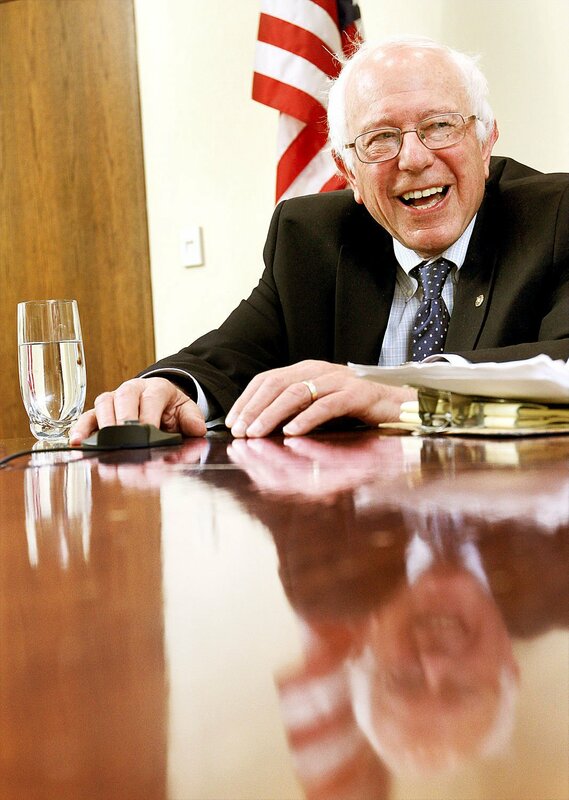 Fast-forward to the prospect of a Sanders presidency in 2016. He envisions a grassroots movement like Barack Obama’s 2008 juggernaut propelling him to office. But with a key difference. “The mistake he made in my view … is the day after he was sworn in, he said to millions of young people, ‘Thank you so much for electing me. I’m on my own now. I’ll take it from here.’ I think he believed sincerely he could sit down with John Boehner and Republican leadership and say I’m willing to compromise. But literally, on the day of his inauguration, Republicans made the plan to obstruct, obstruct, obstruct. Instead, he intends to rally a reform movement that ushers in big ideas that make the grist of his campaign appearances, like Thursday’s town-hall type forum that overflowed St. Ambrose University’s Rogalski Center. Free college. A $15 per hour minimum wage. Single-payer health care with no private, for-profit insurance companies. Emissions controls to curb global warming. “It is very, very difficult. That is why I use the words ‘political revolution,’” he said. That revolution will require caucus turnout higher than this state has ever seen. Only that grassroots support can overcome the tens of millions of dollars in secret contributions that have taken the Iowa caucus campaign out of town halls and other face-to-face meetings and relegated it to TV screens and social media. Sanders and a handful of his Senate office staffers come up with a few memes each week, then push them through social media, where they’re shared and forwarded by millions. These memes are the ideas Sanders hopes can fundamentally change Washington, whether he wins or not. He promises frequent Iowa appearances, including more town halls with more questions from voters. Don’t expect him to trade his rumpled sports jacket for overalls or put a green cap over his unruly white hair. We asked Sanders for past campaigns that may shape his own. He mentioned two. Sanders knew little about the Army logistics and manufacturing center. “6,000 jobs? Wow! They work for the federal government? Then Sanders affirmed his support for defense spending cuts, focusing on fraud and efficiencies.